Today the Bureau of Land Management (BLM) consigned the American public to remain ill-informed about hydraulic fracturing taking place on millions of acres of public property. The Bureau’s long-awaited “fracking rule” designates FracFocus, an industry-funded data repository, as the mechanism for public disclosure of chemicals used in hydraulic fracturing at oil and gas drilling sites on federal and Indian lands. The ruling also affects 58 million acres of “split-estate” lands where the BLM controls the minerals but the surface is owned by private citizens, states, or other non-Federal entities. Besides the fact that this decision flouts the President’s own Executive Order #13642 on Open Data, why are we so concerned about how the government manages fracking data? The reason is because this decision will deprive property and homeowners, scientists, decision-makers, emergency responders, healthcare professionals, and the general public of effective access to information that is vital to investigating the environmental, social, and public health impacts of modern oil and gas drilling. We have said this all along, but you might find it more interesting to hear our points reiterated in this fine speech by Rep. Alan Lowenthal (CA-47) who is a member of the House Natural Resources committee (whom John testified before regarding fracking and transparency only six months before). BLM’s ruling comes less than a month after the Interstate Oil & Gas Compact Commission (IOGCC) and Ground Water Protection Council (GWPC), the operators of FracFocus.org, announced they would be adding new features to the system sometime in 2015. We are concerned that the federal government has no authority to ensure that FracFocus implements these proposed upgrades in a timely way that effectively addresses the serious shortcomings that we, and others, repeatedly detailed during the rulemaking process. We have appealed repeatedly to the BLM through public comment and open letter to the Dept. of Interior officials, asking them to mandate public disclosure of this data in a manner compliant with this administration’s laudable Open Data policy. Unfortunately, designating a non-compliant, industry-funded platform as the curator and public outlet for this data flouts that policy, perpetuates obfuscation about the environmental and health impacts of the controversial “fracking” process, and will fuel continued public apprehension about oil and gas drilling. National Response Center (NRC) Alerts Are Back! This week we restored a nationwide data source to the SkyTruth Alerts system, our free email-based pollution and incident notification tool. For over a year, the public interface for the U.S. Coast Guard’s National Response Center (NRC) has been offline, and we have not been able to send out notifications when new pollution reports are reported. The NRC receives approximately 30,000 reports a year, and about 10,000 of those are in the Gulf of Mexico. This outage substantially limited our ability to research pollution incidents and notify the public about oil and hazardous chemical releases, so we are pleased to announce that we can now provide weekly alerts from this important data source. The Coast Guard has been posting a weekly update of all the reports they receive, in the form of an excel spreadsheet. It has taken us a while to do the necessary data wrangling and re-coding, but we have finally found a way to incorporate this unwieldy file into our Alerts system so we can resume providing you the easy-to-understand email notifications that you’ve been missing. Weekly Updates: We will issue Alerts every time the file is updated at www.nrc.uscg.mil, typically on Tuesday or Wednesday for everything that has been received in the preceding week. Break up your subscription into smaller areas. Just unsubscribe from your current subscription and re-subscribe to a several smaller areas. When you get your weekly email, just click through to the Alerts map (below) to see everything that has happened in your area of interest. NOTE: This map is dynamically updated, but for performance reasons we can only show up to 50 incidents at a time, and we only display Alerts that have occurred in the last 30 days. Be sure to zoom in to the city or county level and pan around to make sure you are seeing everything. Unfortunately, this is best that we can do with the available data, and we won’t be able to restore daily Alerts from NRC data until further upgrades are made on the government’s end. In the meantime, we continue working on a general overhaul that will incorporate more data sources, new features, and improve the overall user experience. We currently have over 2,200 subscribers, which is far more than we ever imagined we would have when we built this tool for our own internal use. We hope you’ll continue to find this service helpful, and while Alerts are free, your donation will certainly help us maintain and improve this resource. To sign up for alerts, or to resubscribe to new areas, visit – alerts.skytruth.org/. /wp-content/uploads/2016/08/test_logo.png 0 0 David Manthos /wp-content/uploads/2016/08/test_logo.png David Manthos2015-03-09 21:44:002017-10-04 09:44:46National Response Center (NRC) Alerts Are Back! 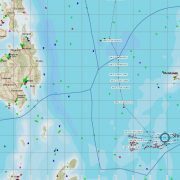 SkyTruth’s analysis of satellite-collected vessel location data recently helped land a ship apparently engaged in illegal fishing in the waters of Palau, an island nation in the Pacific Ocean (listen to the story on National Public Radio). Bjorn’s daily monitoring of AIS data revealed apparent fishing activity throughout December and January by a Taiwan-flagged tuna longliner called the ShinJyi Chyuu 33. This vessel did not have a permit to fish in Palau’s waters, so authorities in Palau launched a patrol boat to intercept it. Working well past midnight and into the early hours of January 21 (Shepherdstown time! ), Bjorn provided updates on the vessel’s position, heading and speed, and predicted where it would be when the patrol boat arrived on the scene more than 200 miles from port. 30-day track of the Shin Jyi Chyuu 33 showing apparent fishing activity in the waters of Palau. AIS data copyright exactEarth. Includes material © 2015 exactEarth Ltd. All Rights Reserved. 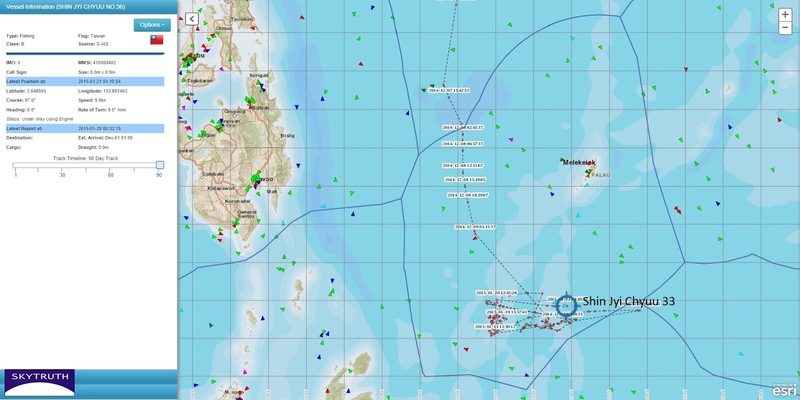 We’re told the Shin Jyi Chyuu was intercepted just 10 miles from the border of Palau’s exclusive economic zone (EEZ). The government of Palau reports that the holds of the Shin Jyi Chyuu were filled with tuna and shark fins. Not a bad day’s work from the hills of West Virginia. Will this “solve” the illegal fishing problem? Not by a long shot, but it does provide a real-life demonstration of what you can do using publicly available data and persistent monitoring. And we hope it will encourage the “good guys” — who are fishing by the rules — to voluntarily make themselves trackable.